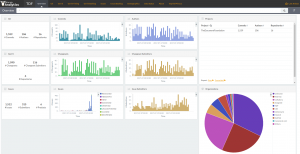 Developed by Bitergia, the Dashboard is based on information retrieved from publicly available data sources, such as Git, Gerrit and Bugzilla repositories, or mailing lists archives. All tools used to retrieve, store, analyse and visualize data from repositories are based on free, open source software. The key component is GrimoireLab, a software development analytics toolset. “The Dashboard shows the key information about LibreOffice development in several panels, each one including different visualizations, with many actionable elements”, says Bjoern Michaelsen, one of TDF BoD members who has managed the project. “When the user interacts with the actionable elements, the information in the whole panel (or in the whole dashboard) are reconfigured, by filtering in or out some data. Following our transparency guidelines, we are therefore offering an open window on LibreOffice development”. “Bitergia was founded by a group of Spanish FLOSS enthusiasts, with a large experience in development, research and consultancy”, says company co-founder Jesus Gonzalez-Barahona. “We are very happy to see our software deployed by The Document Foundation for LibreOffice, one of the largest and most successful free software projects”. Other key software used to produce the Dashboard are Python (to develop most of the retrieval and analytics programs), ElasticSearch (for data storage) and Kibitter, a fork of Kibana contributed back upstream (for data visualization).